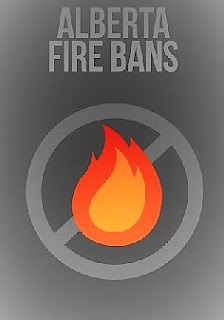 Alberta Fire Bans, effective September 21, 2017 - Within the Municipality of Crowsnest Pass a Fire Restriction has been issued for portions of the Calgary Forest Area section of the Forest Protection Area within fire control zones 1-3, south of Highway 532. The Off-Highway Vehicle Restriction in this area is no longer in effect. Under the restriction fire permits will be issued on a case-by-case basis. Remember to check the hot spots on your Off-Highway Vehicle (OHV) and remove debris before and after use. Never leave a campfire unattended. Soak it, stir it and soak it again until cool to the touch to ensure it is extinguished. If you see a wildfire, report it immediately by calling 310-FIRE. The Fire Restriction will remain in effect until conditions improve.